Kerala, India. Dr. Kazi Nurul Islam, a professor at the Department of World Religions and Culture, University of Dhaka and an Executive Committee member of the Asian Conference of Religions for Peace, was one of the two key discussants at the 8th session with the topic “Interfaith Engagement at Educational Institutions: Promoting Tolerance and sustainable Development” of the Interfaith Summit of South Asia with the theme “Interfaith Harmony and Sustainable Development” on July 25-27, 2016. 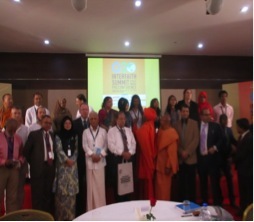 The Institute for Policy, Advocacy and Governance (IPAG) Bangladesh, the Centre for Interfaith & Cultural Dialogue (CICD), Griffith University and Ma’din Academy, Kerala. jointly organized international summit. 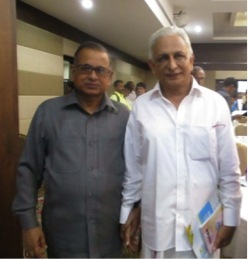 His Excellency, P. Ramakrishna, the Speaker of Kerala State Assembly inaugurated the program. 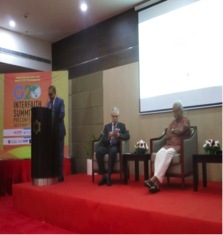 Among the key religious leaders who graced the summit were Swamy Agnivesh, Founder and Chairperson, Bandhu Mukti Morcha; Swami Ritambarananda, General Secretary, Dharma Sangam Trust, Shivagiri Mutt; and, Professor Syed Munir Khashru, Chairman, IPAG, Bangladesh. Prof. Muslim narrated in his discussion how his father inspired him as a boy to dedicate his life for the unity among people of different faith. He explained that it is important to learn one’s own and other’s religion for the promotion of interfaith understanding. He learned various religious traditions not only from books but also from his experiences in many parts of the globe. He realized that more than 85% of the people in the world do not know their own religions correctly, and that 99% do not have sound knowledge about others’ faiths. Ignorance of one’s and other’s religion is the main cause of fanaticism, inter-religious enmity and conflicts. To get rid of this situation he established a Department of World Religions and Culture at the University of Dhaka in 1999. In this Department, all the religions of the world are taught with genuine respect and importance. As a result, every year the University produces a good number of enlightened citizens of the world. He then urged the international delegates to call upon the UNO to see to it that all the universities in the world must establish a department of the academic study of religions based on sound and objective history, philosophy, anthropology, sociology and psychology. He also urged the UNESCO to encourage all secondary schools in the world a compulsory course on the moral teachings of different religions of the world. 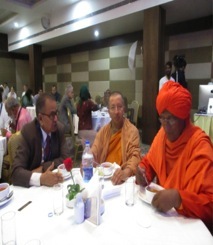 Dr. Kazi Nurul Islam, Dr. Mahinda Deegalle, a renowned Buddhist Scholar and Swamy Agnibesh, and Indian philosopher. Professor Dr. Kazi Nurul Islam of the University of Dhaka is delivering his speech. Professor Dr. Abdelaziz Berghout, Deputy Rector, International Islamic University of Malaysia, is presiding over the seminar.